By October, all LBBG have left the colonies and surrounding feeding grounds near the Maasvlakte (the Netherlands) and migrate south towards France, Portugal and Morocco. In November and to a lesser extend December, a couple of hundreds remain on continental NW Europe, as north as the south of the Netherlands along the coast at Westkapelle, 65 km south of the Maasvlakte (see map). As it seems, every year a larger group of LBBGs stay "at the most northern latitude as possible", i.e. migrate south only when winter conditions force them to. By late November 2000 (a rather mild winter) ringed individuals from Scandinavia, Denmark, the Netherlands, Belgium and the U.K. were present at Westkapelle. When winter really started in December 2000, this group moved south as well to unknown wintering grounds, probably the Atlantic coast of West and South-West Europe. Lesser Black-backed Gull adult, October 13 2015, Katwijk, the Netherlands. Lesser Black-backed Gull adult, October 29 2015, Katwijk, the Netherlands. Lesser Black-backed Gull adult, October 08 2015, Katwijk, the Netherlands. Table above, data for the Netherlands (2000-2010), results for October (aggregated week): number of remaining old primaries in adults. REM0 = 0 old primaries left (P10 dropped). Above: Scatter Plot for PMS in adult Lesser Black-backed Gulls. Number of remaining old primaries throughout the year (arrested moult excluded). Sample size is 6.171 birds. Above: Scatter Plot for PMS in adult Lesser Black-backed Gulls. Number of remaining old primaries for October (arrested moult excluded). Sample size for this graph is 40 ringed birds + 1888 unringed birds. Table above, data for the Netherlands (2000-2010), results for October (aggregated week): number of new, fully grown primaries in adults. 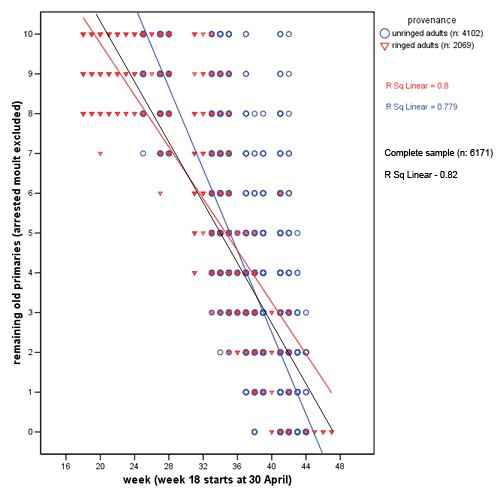 NEW0 = no new primaries visible (arrested moult excluded in this analysis). So either P1 still old, or P1 dropped, but the very tip still not visible. NEW1 = P1 longest new primary. Range between "at least the tip of P1 is visible" until "tip of P2 still shorter than P1". NEW2 = P2 longest new primary. NEW3 = etc. Above: Scatter Plot for PMS in adult Lesser Black-backed Gulls throughout the year. Longest new primary is classified "fully grown". Sample size is 2.969 birds. Birds scored on NEW primaries (arrested moult excluded). Above: Scatter Plot for PMS in adult Lesser Black-backed Gulls. Scoring on longest new primary, which is classified "fully grown" for October (arrested moult excluded). Sample size for this graph is 58 ringed birds + 1266 unringed birds. 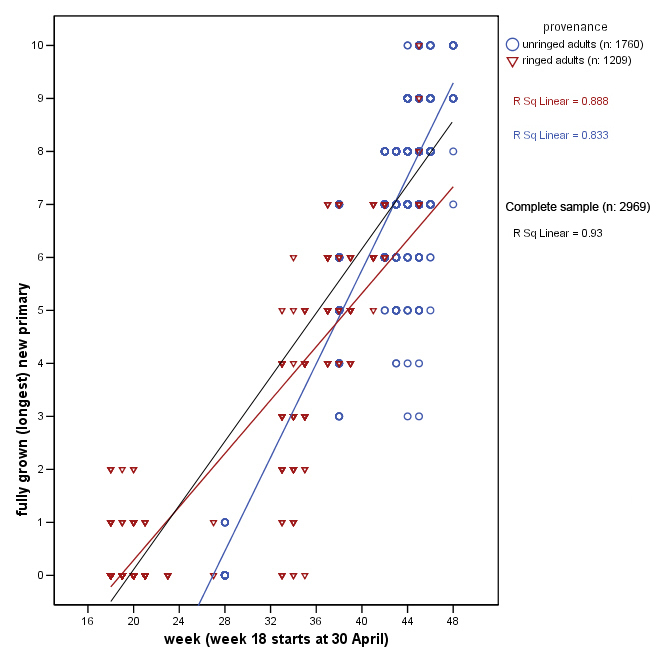 The earliest date for birds with missing primaries is 30 April 2006, which is not the earliest day in our complete sample. We scored 98 Lesser Black-backed Gulls prior to that date, some already in February. As can be expected, none of these was in primary moult, and this group was excluded in our further analysis as it will only result in a misfit for the onset of moult, using linear regression statistics. The last scoring days were in November, with a larger sample (133 adults) on 04 November 2010. From that date we have the last birds with retaining old primaries (13 birds with 1, 2 or even 3 old primaries; 120 birds with no old primaries left). From other days in November, only 10 birds were scored (all ringed adults). They all had no old primaries left. The first tine a new primary (P1) was visible, was on 08 May 2006. Prior to this date, birds were scored missing inner primaries, but the very tip was still not visible (and therefore not scored). As soon as the tip of P1 was visible, this was automatically scored "fully grown" For the other primaries to be scored fully grown, they had to exceed the previous primary in length (so P2 fully grown, only from when it is longer than P1). Peter Stewart presents onset of primary moult by scores for caught adult Lesser Black-backed Gulls in the Severn Estuary, U.K., repeated in the table below. To read his results, see this PDF file. Table: the number of old remaining primaries present. Compare PMS of adult graellsii at half monthly intervals. Data from the Severn Estuary Gull Group by Peter Stewart: The primary moult of the Lesser Black-backed Gull (special publication No 1). Scores in the Netherlands can be influenced by unringed nominate fuscus, in autumn in particular. 1. f.g. (fully grown): including primaries which are not completely fully grown, but all primaries of which the tip exceeds the previous primary in the folded wing. 2. old primaries: total (n) = 235, average (m) = 8,8 standard deviation (SD) = 0,86. 3. new primaries: total (n) = 235, average (m) = 6,7 standard deviation (SD) = 0,66. 4.Adult LBBG scored in a group of 1.500 birds (of which 90% LBBG). A remarkable homogeneous group regarding grey-tone of upper-parts, after three days of western winds. orange CA9 (P10 old, P7 f.g.) ringed as pullus in the Netherlands on July 01 1995, now 8cy. green EA34 (P10 old, P7 f.g.) ringed as pullus in the Netherlands on July 02 1993, now 10cy. green EV62 (P10 old, P7 f.g.) ringed as pullus in the Netherlands on June 21 1997, now 6cy. 2. old primaries: total (n) = 234, average (m) = 9,1 standard deviation (SD) = 0,98. 3. new primaries: total (n) = 234, average (m) = 7,1 standard deviation (SD) = 0,86. 4.Adult LBBG scored in a group of 2.000 birds (of which 30% LBBG). A heterogeneous group regarding grey-tone of upper-parts. orange EV89 (P8 f.g.) ringed as pullus in the Netherlands on July 02 1997, now 6cy. green E774 (P9 = P8 f.g.) ringed as pullus in the Netherlands on July 04 1995, now 8cy. white R23 (P9 old, P6 f.g.) ringed as pullus in the Netherlands on July 06 1991, now 12cy. blue ASAY (P8 f.g.) ringed in Belgium. Lesser Black-backed Gull graellsii Y250 adult, September - December 2016, Matosinhos beach, Matosinhos, Portugal. Picture: José Marques. Lesser Black-backed Gull graellsii 0AS 19CY, October 23 2015, Praia da Aguda, V.N.Gaia, Portugal. Picture: José Marques. Lesser Black-backed Gull graellsii 0.V7 7CY-8CY, September - October 2015, September - November 2016, Matosinhos, Portugal. Picture: José Marques. Lesser Black-backed Gull graellsii 2.K4 adult, October 16 2015, Matosinhos Beach, Matosinhos, Portugal. Picture: José Marques. Lesser Black-backed Gull graellsii 6.C7 7CY, October 25 2016, Matosinhos beach, Matosinhos, Portugal. Picture: José Marques. Lesser Black-backed Gull graellsii 0AT7 adult, September - October 2016, Matosinhos beach, Matosinhos, Portugal. Picture: José Marques. Lesser Black-backed Gull graellsii 0FA1 adult, September - October 2016, Matosinhos beach, Matosinhos, Portugal. Picture: José Marques. Lesser Black-backed Gull graellsii 1AH4 adult, October 31 2016, Espinho Beach, Espinho, Aveiro, Portugal. Picture: José Marques. Lesser Black-backed Gull graellsii 1AZ1 adult, October 25 2016, Matosinhos beach, Matosinhos, Portugal. Picture: José Marques. Lesser Black-backed Gull graellsii 1CJ2 adult, October 20 2015, Matosinhos Beach, Matosinhos, Portugal. Picture: José Marques. Lesser Black-backed Gull graellsii 1FA1 adult, October - November 2016, Matosinhos Beach, Matosinhos, Portugal. Picture: José Marques. Lesser Black-backed Gull graellsii 2AK8 adult, October 27 2015, Matosinhos Beach, Matosinhos, Portugal. Picture: José Marques. Lesser Black-backed Gull graellsii 3AL2 adult, October 2015, September 2016 - January 2017, Matosinhos beach, Matosinhos, Portugal. Picture: José Marques. Lesser Black-backed Gull graellsii 3AP7 5CY, October - November 2016, Matosinhos Beach, Matosinhos, Portugal. Picture: José Marques. Lesser Black-backed Gullgraellsii 3AU9 adult, October 31 2016, Espinho Beach, Espinho, Aveiro, Portugal. Picture: José Marques. Lesser Black-backed Gull graellsii 3AX9 adult, October - November 2016, Espinho Beach, Espinho, Aveiro, Portugal. Picture: José Marques. Lesser Black-backed Gull graellsii 3CH9 adult, October 06 2016, Matosinhos beach, Matosinhos, Portugal. Picture: José Marques. Lesser Black-backed Gull graellsii 4AF8 adult, September - October 2016, Matosinhos beach, Matosinhos, Portugal. Picture: José Marques. Lesser Black-backed Gull graellsii 4AX5 adult, October - December 2015, Matosinhos, Portugal. Picture: José Marques. Lesser Black-backed Gull graellsii 5CC4 adult, September -October 2015, Matosinhos Beach, Matosinhos, Portugal. Picture: José Marques. Lesser Black-backed Gull graellsii 5CT1 adult, September - October 2016, Matosinhos Beach, Matosinhos, Portugal. Picture: José Marques. Lesser Black-backed Gull graellsii 5FA2 adult, October 06 2016, Matosinhos beach, Matosinhos, Portugal. Picture: José Marques. Lesser Black-backed Gull graellsii 6AN1 5CY, September - October 2016, Matosinhos beach, Matosinhos, Portugal. Picture: José Marques. Lesser Black-backed Gull graellsii 6CF6 adult, October 2015, September 2016 - February 2017, Matosinhos beach, Matosinhos, Portugal. Picture: José Marques. Lesser Black-backed Gull graellsii 6CH4 adult, September - October 2016, Matosinhos Beach, Matosinhos, Portugal. Picture: José Marques. Lesser Black-backed Gull graellsii 8AK3 adult, October - November 2016, Matosinhos beach, Matosinhos, Portugal. Picture: José Marques. Lesser Black-backed Gull graellsii 8AM2 adult, October 20 2015, Matosinhos beach, Matosinhos, Portugal. Picture: José Marques. Lesser Black-backed Gull graellsii 8CL6 adult, October 20 2015, Matosinhos beach, Matosinhos, Portugal. Picture: José Marques. Lesser Black-backed Gull graellsii 8CS1 adult, September - November 2016, Leixões harbour, Matosinhos, Portugal. Picture: José Marques. Lesser Black-backed Gull graellsii 8AC0 adult, October 2015 & November 2016, Matosinhos Beach, Matosinhos, Portugal. Picture: José Marques. Lesser Black-backed Gull graellsii 9AH6 adult, September - December 2016, Matosinhos beach, Matosinhos, Portugal. Picture: José Marques. Lesser Black-backed Gull graellsii 9AT6 adult, September - October 2016, Matosinhos beach, Matosinhos, Portugal. Picture: José Marques. Lesser Black-backed Gull graellsii 9AX4 adult, October 2015 & November 2016, Torreira beach, Aveiro, Portugal. Picture: José Marques. Lesser Black-backed Gull graellsii 9CF6 adult, September - October 2016, Matosinhos beach, Matosinhos, Portugal. Picture: José Marques. graellsii adult 9CJ0 October 26 2014, Landfill VRSU de Colmenar Viejo, Madrid, Spain. Picture: Delfín González. graellsii adult APF October 21 2004, Westkapelle, the Netherlands. Picture Pim Wolf. graellsii adult ATN October 22 2004, Westkapelle, the Netherlands. Picture Pim Wolf. graellsii 6cy LSY October 22 2004, Westkapelle, the Netherlands. Picture Pim Wolf. graellsii adult YLS October 19 2004, Westkapelle, the Netherlands. Picture Pim Wolf. Lesser Black-backed Gull graellsii F:Z 11CY, October - November 2015, Matosinhos Beach, Matosinhos, Portugal. Picture: José Marques. Lesser Black-backed Gull graellsii B:V 14CY-15CY, September 2015 & October 2016, Matosinhos beach, Matosinhos, Portugal. Picture: José Marques. Lesser Black-backed Gull graellsii F+P 8CY, October 11 2016, Leça Beach, Matosinhos, Portugal. Picture: José Marques. Lesser Black-backed Gull graellsii T:87J adult, October - December 2016, Matosinhos, Portugal. Picture: José Marques. Lesser Black-backed Gull graellsii 9H:W adult, October 16 2015, Matosinhos Beach, Matosinhos, Portugal. Picture: José Marques. Lesser Black-backed Gull graellsii 5JG adult, September - October 2015, Matosinhos Beach, Matosinhos, Portugal. Picture: José Marques. Lesser Black-backed Gull graellsii 6SF 5CY & 7CY, October 2015 & February 2017, Matosinhos beach, Matosinhos, Portugal. Picture: José Marques. Lesser Black-backed Gull graellsii 4.Z3 8CY-9CY, October- December 2015 & September - November 2016, Torreira beach, Beira Litoral, Portugal. Picture: José Marques. Lesser Black-backed Gull graellsii JZ adult, October 09 2015, Matosinhos Beach, Matosinhos, Portugal. Picture: José Marques. graellsii adult GG-63238 Westkapelle, the Netherlands, October 04 2004. Photo by Pim Wolf. Lesser Black-backed Gull graellsii BTO GG-86885 25CY, October 09-20 2015, Leixões Harbour, Matosinhos, Portugal. Picture: José Marques. Lesser Black-backed Gull graellsii ZMAC 14CY, October 06 2016, Matosinhos beach, Matosinhos, Portugal. Picture: José Marques. Lesser Black-backed Gull graellsii 188K 10CY, September - October 2016, Matosinhos beach, Matosinhos, Portugal. Picture: José Marques. Lesser Black-backed Gull graellsii 912K adult, October 09 2015, Matosinhos Beach, Matosinhos, Portugal. Picture: José Marques. Lesser Black-backed Gull graellsii 3:AAA adult, October 07 2016, Matosinhos beach, Matosinhos, Portugal. Picture: José Marques. Lesser Black-backed Gull graellsii R:K9E adult, October 09 2015, Matosinhos Beach, Matosinhos, Portugal. Picture: José Marques. Lesser Black-backed Gull graellsii R:E1J adult, September - October 2016, Matosinhos beach, Matosinhos, Portugal. Picture: José Marques. Lesser Black-backed Gull graellsii R:C6V adult, September - October 2016, Leixões Harbour, Matosinhos, Portugal. Picture: José Marques. Lesser Black-backed Gull graellsii A.L0H adult, September - October 2016, Matosinhos beach, Matosinhos, Portugal. Picture: José Marques. Lesser Black-backed Gull graellsii DAA.Z adult, October 31 2016, Espinho Beach, Espinho, Aveiro, Portugal. Picture: José Marques. Lesser Black-backed Gull graellsii D.FAY adult, October 01 2009, Westkapelle, the Netherlands. Dutch intergrade 15cy & 17cy DKAN October 2009 & September 2011, Westkapelle, the Netherlands. Dutch intergrade 7cy GHAR October 31 2013, Westkapelle, the Netherlands. Lesser Black-backed Gull graellsii GT.AM adult, October 20 2015, Matosinhos, Portugal. Picture: José Marques. Lesser Black-backed Gull graellsii LC.AS adult, October 27 2010, Westkapelle, the Netherlands. Lesser Black-backed Gull graellsii L.DAN adult, October 06 2009, Westkapelle, the Netherlands. Dutch intergrade BLB L - 7400? October 05 2002, Le Portel / Boulogne-sur-Mer, NW France. Dutch intergradeBLB L - 80954 October 22 2001, Westkapelle, the Netherlands. Dutch intergrade 5cy BLB L - 85168 October 30 2003, Westkapelle, the Netherlands. Lesser Black-backed Gull graellsii G||S adult, October 07 2016, Matosinhos beach, Matosinhos, Portugal. Picture: José Marques. Lesser Black-backed Gull graellsii H5 adult, May 2006, October 2011 & August 2016, the Netherlands. Picture: Theo Muusse, Maarten van Kleinwee & Henri Zomer. Lesser Black-backed Gull graellsii 6K adult, September 2015 & December 2016, Matosinhos beach, Matosinhos, Portugal. Picture: José Marques. Lesser Black-backed Gull graellsii LY adult, October 2015 - February 2016 & November 2016 - January 2017, Matosinhos, Portugal. Picture: José Marques. Lesser Black-backed Gull graellsii UJ adult, October 07 2016, Matosinhos beach, Matosinhos, Portugal. Picture: José Marques. Lesser Black-backed Gull graellsii WD adult, October 06 2016, Matosinhos beach, Matosinhos, Portugal. Picture: José Marques. Lesser Black-backed Gull graellsii 2.G 5CY, October 07 2016, Matosinhos beach, Matosinhos, Portugal. Picture: José Marques. Lesser Black-backed Gull graellsii GX adult, October - November 2016, Matosinhos Beach, Matosinhos, Portugal. Picture: José Marques. Lesser Black-backed Gull graellsii CY 7CY-9CY, July 2014 & October 2015 - November 2016, NW France & Portugal. Picture: Jean-Michel Sauvage & José Marques. Lesser Black-backed Gull graellsii YZ 7CY, October 06 2016, Matosinhos beach, Matosinhos, Portugal. Picture: José Marques. LBBG RD October 11 2010, Madrid, Spain. Photo by Delfín González. Lesser Black-backed Gull graellsii R.7 adult, October 09 2015, Matosinhos Beach, Matosinhos, Portugal. Picture: José Marques. LBBG WE October 11 2010, Madrid, Spain. Photo by Delfín González. LBBG HF October 11 2010, Madrid, Spain. Photo by Delfín González. Lesser Black-backed Gull graellsii PU 9CY, October 16 2015, Matosinhos Beach, Matosinhos, Portugal. Picture: José Marques. LBBG P8 October 27 2006, Westkapelle, the Netherlands. LBBG 6L October 08 2014 & May 2006, the Netherlands & France. Picture: Jean-Michel Sauvage. Lesser Black-backed Gull graellsii HL adult, May 2015 & October 2016, Moerdijk & Katwijk, the Netherlands. Lesser Black-backed Gull graellsii T2 adult, May 2005, May 2006 & October 2016, the Netherlands & Portugal. Picture: Mars Muusse & José Marques. Lesser Black-backed Gull graellsii K.AWV 5CY, October 25 2016, Matosinhos beach, Matosinhos, Portugal. Picture: José Marques. LBBG 6cy KLAX October 21 2012, Spain. Also as 4cy in Holland. Lesser Black-backed Gull graellsii K.YAY 8CY, October 10 2016, Leixões harbour, Matosinhos, Portugal. Picture: José Marques. LBBG YAHJ 2009-2011, France & the Netherlands. Pictures: Ruud Altenburg & Jean-Michel Sauvage. LBBG YAKZ 2010-2011, IJmuiden-Westkapelle, the Netherlands. Lesser Black-backed Gull graellsii Y.AWC 3CY & 5CY, June 2013 & October 2015, the Netherlands. Picture: Maarten van Kleinwee & Merijn Loeve. Lesser Black-backed Gull graellsii Y.BAC adult, September - October 2016, Matosinhos beach, Matosinhos, Portugal. Picture: José Marques. Lesser Black-backed Gull graellsii Y.BJS adult, October 31 2016, Espinho Beach, Espinho, Aveiro, Portugal. Picture: José Marques. 15cy E864 October 06 2009, Westkapelle, the Netherlands. 5cy ECJ9 October 14 2001, Westkapelle, the Netherlands. 9cy EN22 October 19 2004, Westkapelle, the Netherlands. 11cy JP2 October 11 2003, Westkapelle, the Netherlands. 16cy JR6 October 19 2008, Madrid, Spain. Photo by Delfín González. 11cy KN8 October 03 2003, Scheveningen, the Netherlands. 10cy E737 October 04 2004, Westkapelle, the Netherlands. Picture Pim Wolf. 8cy EL74 October 11 2003, Westkapelle, the Netherlands. 6cy ECK1 October 03 2002, Boulogne-sur-Mer, NW France. 6cy EH10 Westkapelle, the Netherlands, October 21 1999. Photo by Pim Wolf. Born summer 1994 in the Netherlands. 7+cy ER73 Westkapelle, the Netherlands, October 15 & 27 1999. Photo by Pim Wolf. 5cy E214 October 04-07 2004, Westkapelle, the Netherlands. Picture Pim Wolf. 5cy E219 October 01 2004, Westkapelle, the Netherlands. Picture Pim Wolf. Also seen as 2cy at Westkapelle. 5cy 7F October 09 2010, Heemskerk, the Netherlands. 5.362.926 October 13 2001, Westkapelle, the Netherlands. 5.366.905 October 09 2005, Westkapelle, the Netherlands. Lesser Black-backed Gull graellsii H.501 3cy-5cy, 2009-2010, Leiden, the Netherlands. Pictures Maarten van Kleinwee. From N Germany, the overlap zone of graellsii "Dutch intergrade" and intermedius. Lesser Black-backed Gull graellsii H.L84 adult, October 10 2016, Katwijk, the Netherlands. Lesser Black-backed Gull graellsii HXE2 adult, October 16 2015, Matosinhos Beach, Matosinhos, Portugal. Picture: José Marques. Lesser Black-backed Gull graellsii HT08 adult, October 03 2016, Katwijk, the Netherlands. Lesser Black-backed Gull graellsii DEH 4290815 7cy, October 03 2012, Boulogne-sur-Mer, NW France. Picture: Jean-Michel Sauvage. Lesser Lesser Black-backed Gull intermedius V3PJ 3CY & 9CY, September 2010 & October 2016, the Netherlands & Portugal. Picture: Maarten van Kleinwee & José Marques. 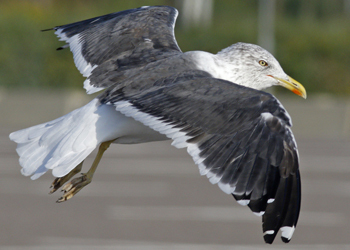 Lesser Black-backed Gull intermediusV3SJ 2CY & 6CY, July 2010, August 2014 & October 2014, Utrecht, the Netherlands. Lesser Black-backed Gull intermedius V.231 8CY, October 13 2015, Leixões Harbour, Matosinhos, Portugal. Picture: José Marques. Lesser Black-backed Gull intermedius VC5M adult, June & September 2010 & October 2012, Denmark, the Netherlands, Spain. Lesser Black-backed Gull intermedius V.JA7 adult, October 06 2016, Matosinhos beach, Matosinhos, Portugal. Picture: José Marques. Lesser Black-backed Gull intermedius DKC 467213 9cy, October 14 2001, Westkapelle, the Netherlands. Lesser Black-backed Gull intermedius DKC 4041636 28CY, October 27 1999, Westkapelle, the Netherland. Picture: Pim Wolf. Lesser Black-backed Gull intermedius DKC 4041916 27CY, October 26 1999, Westkapelle, the Netherland. Picture: Pim Wolf. Lesser Black-backed Gull intermedius DKC 4124822 13CY, October 25-27 1999, Westkapelle, the Netherland. Picture: Pim Wolf. Lesser Black-backed Gull intermedius DKC 4130670 15cy, October 04 2004, Westkapelle, the Netherlands. Picture by Pim Wolf. Lesser Black-backed Gull intermedius DKC 4253409 7CY-8CY, October 2003, IJmuiden & October 2004 Westkapelle, the Netherlands. intermediusxxx Westkapelle, the Netherlands, October 19 2004. Photo by Pim Wolf. Lesser Black-backed Gull intermedius JJ5A 5CY, October 09 2009, IJmuiden, the Netherlands. Lesser Black-backed Gull intermedius JM79 adult, October 19 2002, Westkapelle, the Netherlands. Lesser Black-backed Gull intermedius JS26 8+cy, October 10 2004, Westkapelle, the Netherlands. Picture by Pim Wolf. Lesser Black-backed Gull intermedius J5YL 5+cy, October 14 2012, Westkapelle, the Netherlands. Lesser Black-backed Gull intermedius J6UX adult, October 01 2013, Portimao, Portugal. Picture: Carl Baggott. Lesser Black-backed Gull intermedius JE8J adult, October & December 2012, Madrid, Spain. Photo by Delfín González. Lesser Black-backed Gull intermedius JU5H adult October 24 2015, Westkapelle, the Netherlands. Lesser Black-backed Gull intermedius NOS 41699 adult, October 22 2001, Westkapelle, the Netherlands. Lesser Black-backed Gull intermedius NOS 492155 15CY, October 20 1999, Westkapelle, the Netherlands. Picture: Pim Wolf. Lesser Black-backed Gull intermedius NOS 492441 20 & 25CY, October & November, Westkapelle, the Netherlands. Picture Pim Wolf. Lesser Black-backed Gull intermedius NOS 4100410 18CY-19CY, October 2003 & September 2004, Westkapelle, the Netherlands. Lesser Black-backed Gull intermedius NOS 4105805 5CY, October 02 2003, IJmuiden, the Netherlands. Lesser Black-backed Gull intermedius NOS 4107889 adult, October 01 2009, Westkapelle, the Netherlands. Lesser Black-backed Gull intermedius NOS 4108778 14CY, October 27 1999, Westkapelle, the Netherland. Picture: Pim Wolf. Lesser Black-backed Gull intermedius NOS 4119689 22+cy, October 19 2004, Westkapelle, the Netherlands. Picture by Pim Wolf. Lesser Black-backed Gull intermedius NOS 4170571 12CY, October 19 2004, Westkapelle, the Netherland. Lesser Black-backed Gull intermedius NOS 4178002 14CY, October 21 2004, Westkapelle, the Netherlands. Picture by Pim Wolf. iLesser Black-backed Gull intermedius NOS 4199556 10CY, October 21 2004, Westkapelle, the Netherlands. Picture by Pim Wolf. Lesser Black-backed Gull intermedius NOO NA-08134 adult, October 19 2004, Westkapelle, the Netherlands. Lesser Black-backed Gull intermedius NOO NA-0846x adult, October 10 2003, Scheveningen, the Netherlands. Lesser Black-backed Gull intermedius NOO NA-09175 adult, October 18 2002 Westkapelle, the Netherlands. Lesser Black-backed Gull intermedius SVS 8072924 15CY, October 19 2004, Westkapelle, the Netherlands. Lesser Black-backed Gull intermedius SVS 8080900 11CY, October 19 2004, Westkapelle, the Netherlands. Lesser Black-backed Gull intermedius SVS 8088508 11CY, October 22 2009, Westkapelle, the Netherlands. Lesser Black-backed Gull intermedius SVS 8105583 7+CY, October 06 2009, Westkapelle, the Netherlands. Lesser Black-backed Gull graellsii F620 adult, October 07 2016, Matosinhos beach, Matosinhos, Portugal. Picture: José Marques. Lesser Black-backed Gull M:011 adult, September - November 2016, Matosinhos, Portugal. Picture: José Marques. LBBG intermedius ?04546 October 04 2002, Le Portel / Boulogne-sur-Mer, NW France. LBBG intermedius adult 408972 Breskens, the Netherlands, October 20 1999. Photo by Pim Wolf. Most probably with Stavanger (Norway) ring. LBBG intermedius adult 492155 Breskens, the Netherlands, October 20 1999. Photo by Pim Wolf. Most probably with Stavanger (Norway) ring. LBBG intermedius adult ..746.. Breskens, the Netherlands, October 20 1999. Photo by Pim Wolf. LBBG intermedius 4196602 October 04 2002, Le Portel / Boulogne-sur-Mer, NW France. LBBG adult N537 October 05 2005, Westkapelle, the Netherlands. Link to 13 unringed adult LBBG, October 22 2001, Westkapelle, the Netherlands.